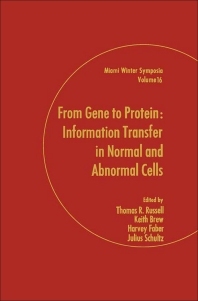 Miami Winter Symposia, Volume 16: From Gene to Protein: Information Transfer in Normal and Abnormal Cells presents the expression and processing of genetic information at the levels of both proteins and nucleic acids. This book deals with the reassembly and mobilization of genetic information. Organized into 105 chapters, this volume begins with an overview of the discovery of the double helix and the search for the genetic code and the three-dimensional structure of protein. This text then examines the molecular mechanism by which steroid hormones regulate specific gene expression. Other chapters consider the possible hazards inherent to hybrid DNA technology. This book discusses as well the various problems of gene control in higher organisms, which are illustrated by the changes that occur in the hemoglobin of mammals. The final chapter deals with the characterization of adenovirus-2 mRNAs. This book is a valuable resource for biochemists, genetic engineers, enzymologists, scientists, geneticists, and molecular biologists. Is There a Different Mode of DNA Synthesis in Normal and Transformed Human Diploid Fibroblasts? Gene Expression of Mammalian Lens Tissue: Is Lens mRNA Bicistronic? Characterization of a Cytoplasmic Poly(A)-Protein Complex: Endproduct or Byproduct of Messenger RNA Metabolism?